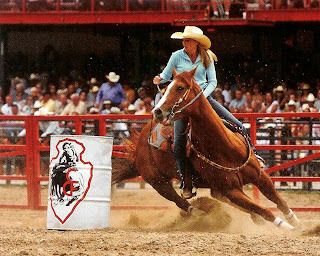 I must confess I watch the horses as much or more than the contestants, although they are one and the same thing – the bucking horses doing the best job they can so riders can score the best, calf roping (I know – it’s tie-down roping now!) and steer wrestling horses carrying their partners to the calf or steer and, of course, my personal favourites – the barrel horses. The intelligence, courage and talent of these dedicated athletes (the horses, I mean) astound me. Most horses would rather be in the pasture doing nothing but eating and sleeping but these horses look like they love their job. For sure, they know their job. And, like the contestants, a few stand out above the rest. Who cannot appreciate Sweetness or Jessie or Martha? Jessie is a 16 year old black AQHA gelding, Lee Graves’ steer wrestling horse. He is named for Jessie James – because sometimes he is a little hard headed. Seems he “failed’ at several disciplines (racing, calf-roping, barrel racing) because he did it until he didn’t want to! Steer wrestling was a fit. 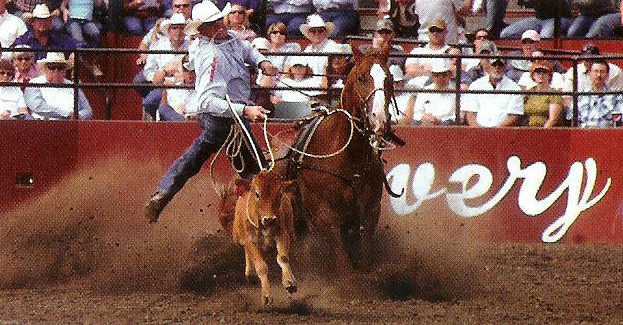 Sweetness is Clint Cooper’s main mount in tie-down roping. He is 19 years old I believe and still going strong. 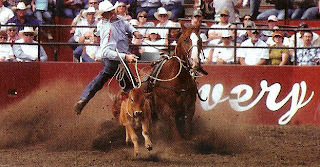 As I watched him in the NFR, I marveled at his intelligence and “feel”. 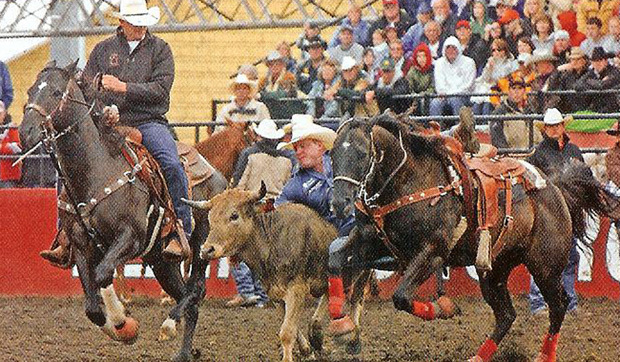 Ears forward, eyes firmly fastened on calf and then rider when he is tying, he keeps the rope tight but not too tight, moves left or right as needed. Incredible. Sweetness is named for Pro football player, Walter Payton – he even carries Payton’s number – 34 – on his shoulder. And Martha – what cannot be said about Martha! 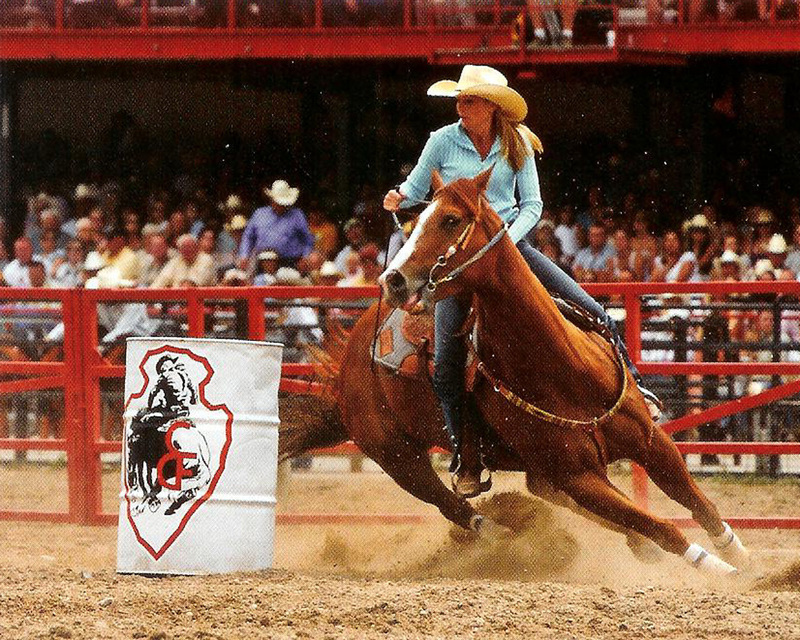 She has “made” Lindsay Sears in the barrel racing world. (I read somewhere that Lindsay said when Martha cannot compete any more she would quit competing...)With her unique turn, incredible speed and unstoppable courage, she has endeared herself to many. Lindsay and Martha represented Canada at NFR (the only Canadians!) and what a job they did, winning the average and the World title! So yes – I enjoyed watching cowboy after cowboy compete through ten performances of the finals but it was the horses that stole my heart - not just Martha, Jessie and Sweetness but all of them. They are all deserving of recognition for they are the partners of the contestants that qualified for NFR. Without their horses, the contestants are nothing. I'm pretty sure they know that. Beautiful horses and cowboys in black shirts caught my eye at NFR! Guess I wasn't looking at horses all the time... nothing better than a good looking cowboy in a black shirt! I, too, especially enjoyed the barrels and watching Martha. She truly does wrap around them. Last winter at a barrel racing in AZ, we met Deana Kirkpatrick (hope I have the name correct) - the gal who trained Martha and sold her to Lindsay. Also met Sue Smith at Agilla. She endorses/sells some of Dave's bits. She and Claimer certainly didn't have a fun finals. In any case it's absolutely wonderful that we can watch everything from our home.